Fortuna did not disappear from the popular imagination with the ascendancy of Christianity. Lady Fortune was the Middle Ages idea of the original goddess of fortune, Fortuna. 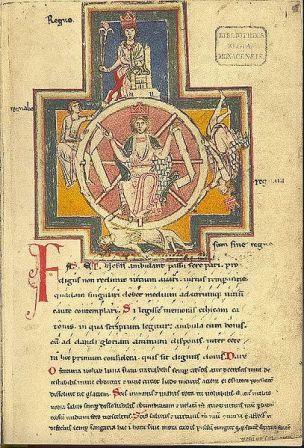 The omnipresent image of the Wheel of Fortune found throughout the Middle Ages and beyond was a direct legacy of the second book of Boethius’s Consolation. 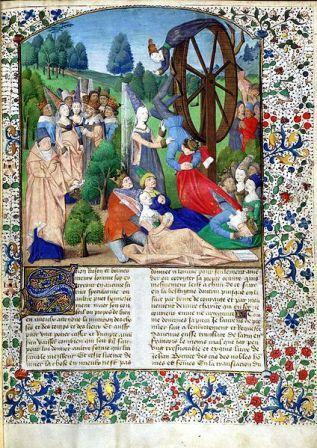 The Wheel appears in many renditions from tiny miniatures in manuscripts to huge stained glass windows in cathedrals. The Wheel of Fortune, or Rota Fortunae, was a concept in medieval and ancient philosophy referring to the capricious nature of Fate. The wheel belongs to the goddess Fortuna, who spins it at random, changing the positions of those on the wheel – some suffer great misfortune, others gain windfalls. Lady Fortune is usually represented as larger than life to underscore her importance. Medieval representations of Fortune emphasize her duality and instability, such as two faces side by side like Janus; one face smiling the other frowning; half the face white the other black; she may be blindfolded but without scales, blind to justice. She was associated with the cornucopia, ship’s rudder, the ball and the wheel. The cornucopia is where plenty flows from, the Helmsman’s rudder steers fate, the globe symbolizes chance (who gets good or bad luck), and the wheel symbolizes that luck, good or bad, never lasts. Fortune would have many influences in cultural works throughout the Middle Ages. The Christianized Lady Fortune appeared different ways, among them in chapter 25 of Machiavelli’s The Prince, in which he says Fortune only rules one half of men’s fate, the other half being of their own will. Machiavelli reminds the reader that Fortune is a woman, that she favors a strong or even violent hand, and that she favors the more aggressive and bold young man than a timid elder. Under the title Dame Fortune, Fortuna never lost Her power as an allegorical figure; She makes an appearance on card 10 of the Tarot Major Arcana, the Wheel of Fortune, and She is still to some extent honored today, for She features in gamblers’ prayers to “Lady Luck“. The ancient Romans and Greeks believed in a wide range of gods and goddesses. Many of these may originally have had a connection with forces of nature, natural phenomena and may have had characteristics similar to the characteristics they displayed in human life. If you want luck in order to get the one you are after, it is now possible to add the classic touch to your place with beautiful Ithaca’s hand-crafted wall art sculptures, representing the goddess of chance, success and fortune. 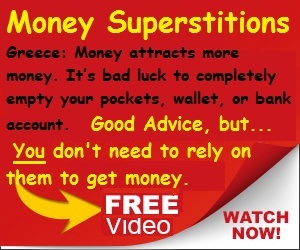 Fortune in Roman mythology, the personification of chance or luck is the equivalent of the Greek goddess Tyche. Daughter of Oceanus, she differed from her sisters’ Fates who were goddesses engaged in spinning the thread of human life, in that she worked without rule, giving or taking away at her own pleasure and dispensing joy or sorrow indifferently. She might bring good or bad luck and she was often represented as veiled and blind, as in modern depictions of Justice, and came to represent life’s capriciousness. Greek artists generally depicted the goddess Fortune with a globe or a rudder, as emblems of her guiding power, or wheel or wings as a symbol of her mutability. Famously renowned for favouring the brave and the fools, the Roman and Greek goddess of chance and luck always favoured those willing to take a chance and those who used the opportunities that were presented to their full advantage. The goddess Fortune rewarded those who embraced life and who did their best to flow and learn from the ebbs and currents that are a part of it. The Romans proudly declared that when she entered their city she threw away her globe and took off her wings and shoes to indicate that she meant to dwell with them forever. Later, she is represented with a bandage over her eyes and a sceptre in her hand, sitting or standing on a wheel or globe. Now you can take your Fortuna home or you can present it as a good luck charm to your friends. ABOUT ITHACA ART: Ithaca Art http://www.ithaca-art.com is one the leading sources of museum-quality Greek and Roman reproductions. With a new UK website launched last month, Ithaca Arts’ artists are trained in art history and classic craftsmanship. Each piece of art is handmade using the same ancient techniques and materials as the originals. Museum gift shops throughout Europe fill their shelves with the quality works of Ithaca.